With the holidays over and winter settling in, I’ve been organizing the spare room to set up a workbench and test track. It’s a tough puzzle as five boxes need to move before I can move some other boxes into the space the five boxes were sitting. If I move too many boxes, then I have a hard time weaving through the narrow openings to the door. I’ve already moved a couple of the boxes out to the storage barn, but the space is tight. I received a couple of emails to offer a welcome break from the unending movement of boxes. 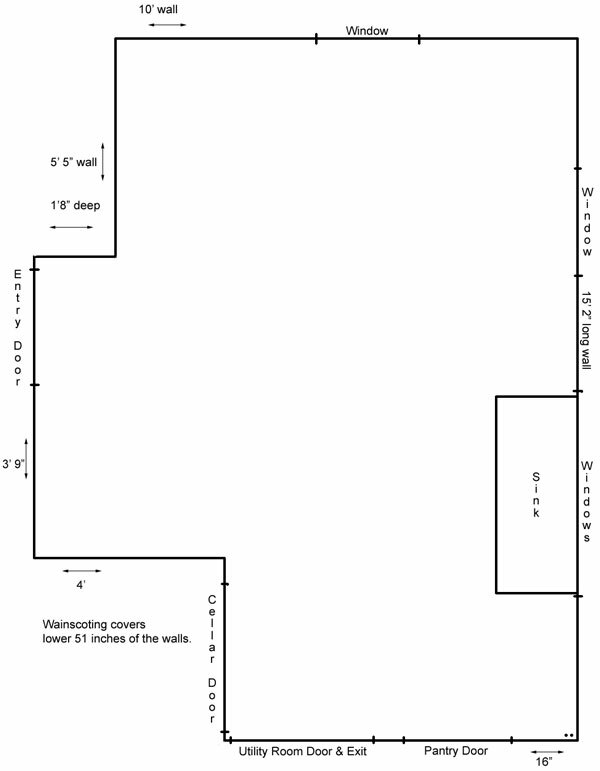 My friend John in Ohio is wrapping up room prep on his new 12×22 foot layout space and wanted suggestions for the area. I enjoy a trackplanning challenge! The image above was taken on his old layout. John wants to model the Carrollton Branch of the Wheeling and Lake Erie Railroad, but in the last few months as it was owned and operated by the Nickel Plate Road in 1963. The above image was taken at Minerva Junction in the mid-1920s and is from the W&LE Special Collection in the Michael Schwartz Library of Cleveland State University. This 27 mile Ohio branch stretched from Canton to Carrollton with a three mile offshoot to Minerva that connected with a New York Central coal branch. The endpoints are key elements to the plan along with a small town and tunnel at Robertsville. John enjoys switching and local work, so he wants to include some industries at the Canton end of the branch. John’s previous layout was a shelf in his garage that only included Carrollton. The lead image and the one below were both taken on the previous layout. So how do we begin this exercise? First, I review prototype track arrangements and whatever prototype details I can lay my hands upon. I have visited parts of the branch, so I have experiences in the prototype field. I’ve operated on John’s previous layout and helped him with various operations questions, so I’m ahead of the curve in my understanding of the prototype branch line and John’s railroad needs. 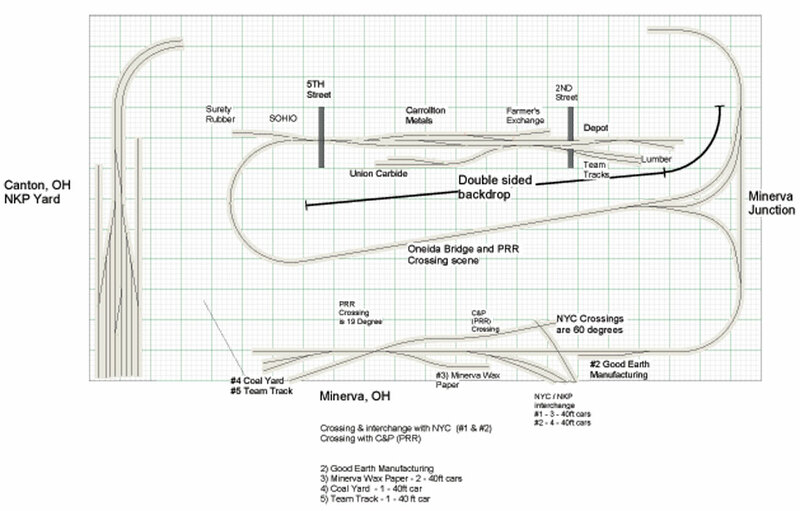 Official track diagrams of this branch available to view on the internet. The Rails and Trails website has a wide variety of transportation maps, timetables, and diagrams ready to view. One of these is a book of W&LE track diagrams dating from 1963, when the Nickel Plate owned the lines. These diagrams, along with many other maps and files on this site, can be viewed with a DjVu plugin. Just scroll to the bottom of that page and click on the DjVu link to find out more about the software and to find a freeware download link. Once you have the DjVu software rolling, then you can click on a link to see the book. The Carrollton Branch is in the Cleveland Division book, pages 92-102. A great feature of these track books are the local industry listings with the track lengths. Right off the bat we have a nice batch of detail to use in planning a model railroad. Next I need to see what special desires the layout owner has for the space. In his initial email, John wanted to fit a long narrow workbench along the short wall near the door and insisted upon no areas of ducking under the layout. He preferred to have Minerva and Carrollton in opposite aisles to minimize people problems, and he supplied a room outline with dimensional detail. With prototype and room details in hand, it’s time to start doodling and dreaming. I make a simple line diagram schematic so I don’t forget the town locations as I start drawing. Click on this image to see the larger schematic. John’s good friend Tim has already come up with an interesting plan. Actually, he’s done two versions that follow a similar idea. Here’s Tim’s first effort, which is focused on the relationship between Minerva and Carrollton and fitting the specific industries into place. Just click on the image to see a larger plan. After a couple of emails, Tim had altered the original plan and added elements along the main line. Click on the image for a larger plan. I prefer to draw initial plans by hand so I can understand the space. I use a pencil, some cardboard discs for curves, and a straightedge to draw tangents. I also created a tool for drawing turnouts, but I usually try to place the mainline first to maximize curvature and distances between towns. Here’s my rough first effort. Now I’m going off a bit on this exercise. Rather than design the layout for John, I’m going to design a plan that I would want to build if I had this kind of room. Believe me, I really wish I had this kind of room. I enjoy distance between towns and grades along the way. The runs along the walls have great potential for a climbing railroad grade. With a two-percent grade, you need fifty feet of main line track to raise the rails twelve inches. I’m becoming a fan of narrow benchwork and this W&LE branch line has plenty of rural running that fits a narrow space. I prefer more industrial action on the Canton end for operational balance, so additional elements will be added to that area. I used the initial plan and kept extending the main line around the room to create the next plan. I developed an HO scale layout design that uses multiple levels as the rails circle the room and climb to Carrollton. The distance between points is stretched out and operating the train to Carrollton and back will give an impression of distance from the population and industry hub. The Canton Yard acts as the operational staging area. Note that I changed the door to one that swings out from the room, rather than into the room. It could also be a sliding door. Simply changing how the door opens can maximize the opportunities within the defined space. All turnouts are #6, except where noted. The curves are at least 26 inch radius for most of the running tracks. The east Canton passing siding is drawn at 24 inches, but I’d recommend making it slightly larger if this plan will be built. I drew this quickly and it is not perfect. I wanted to focus on just one pass through for the initial drawing to see what I could share quickly. Here’s the lowest level where trains begin their day working the branch. Trains to Carrollton would exit the yard and pass through East Canton. On this level, I included some of the East Canton industries to encourage local work out of the yard. At the other end of the yard, I continued the tracks across the door to access the Belden Switch; a short industrial spur off of the Canton Yard. Click on the image to see a larger plan of this lower level. Partway through the East Canton siding a two percent uphill climb begins. There are fifty linear feet of rail as the tracks skirt the peninsula and come back around to the door. With a two percent grade, the rails rise one foot in that run. 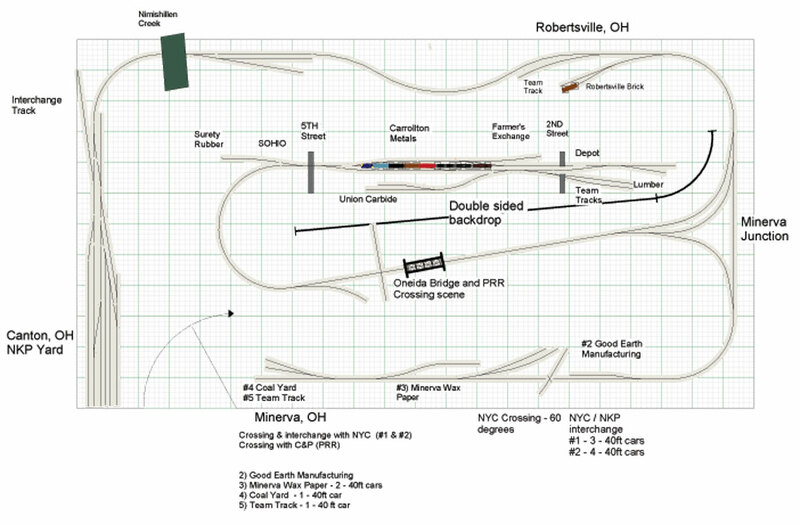 As the distance to Robertsville is extended, the clay products spur and team track was added for Mapleton. The grade levels off through Robertsville then picks up again just after the passing siding for another two percent rise to Minerva Junction. As the tracks enter the junction, the rails are almost 17 inches above the East Canton rails. Several roadway crossings are also included in the plans. Click on the image to see a larger plan of this middle level. A wye at Minerva Junction was used to turn locos in the steam era. A short passing siding is here as well as a water tank. These elements are seen in the period image earlier in this post. One leg of the wye extends three miles to Minerva and a connection with a New York Central branch. Full coal trains came off the NYC here destined for the Goodyear Tire factory in Akron, Ohio. The W&LE would hand off the coal to the Akron, Canton & Youngstown at Mogadore, just east of Akron. The Minerva Branch tracks follow the perimeter of the layout benchwork to access the industries and interchange at Minerva. Not every track could fit and the length of prototype industrial tracks are shorter. If you think Minerva looks squirrelly, well you are correct. 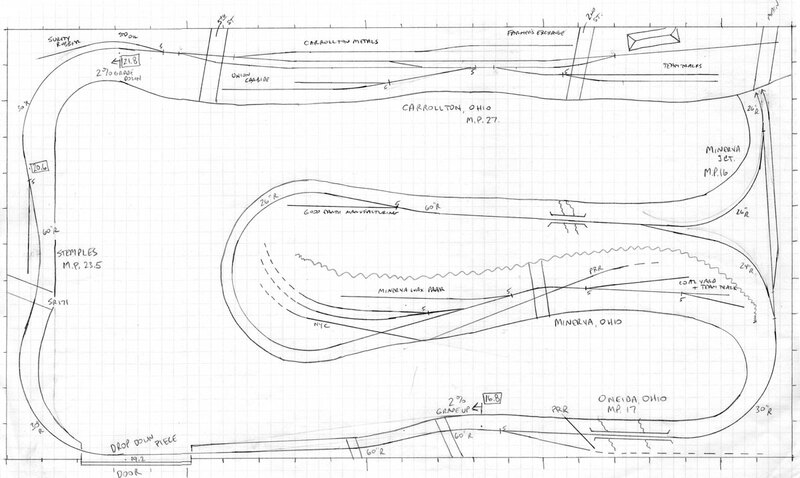 The track arrangement is what the W&LE crews had to deal with, so it becomes a part of the model railroad design. The squiggly line behind Minerva is a backdrop. Click on the image to see a larger plan of this upper level. We go back to Minerva Junction and continue to Carrollton. The rails cut behind the peninsula, which is bothersome when operating but this is one of the few ways to add the Minerva Branch to a room this size. The next location along the way is Oneida. A fabulous, century-old, pin-connected truss bridge spans the creek here and remains in use. The Wheeling once interchanged with the Pennsylvania Railroad here, but it wasn’t as busy as the NYC interchange in Minerva. 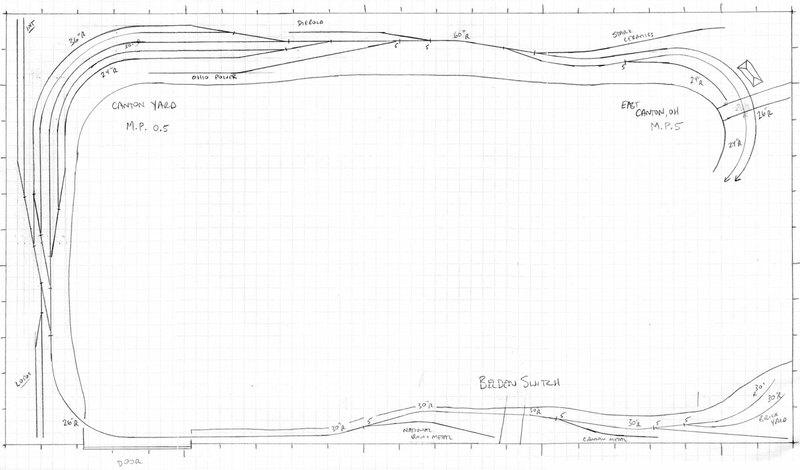 The dashed lines in the plan represent hidden tracks for additional freight car capacity. Oneida is a nice prototype location that can be easily modeled on a narrow shelf. The two percent grade kicks in one last time as the rails approach Carrollton. There was another side track at Stemples that was probably once used for less than carload delivery or as a team track. I thought it would be a nice addition in the space between Oneida and Carrollton. The grade ends as the rails make the last curve into Carrollton. There was a mix of small and mid-sized industry here; a Union Carbide operation, Surety Rubber, a Standard Oil depot, a grain elevator and the team tracks. The rails end here, 27 miles from the Canton Yard. After spotting the incoming freight cars and pulling outbounds, the crew would head back to Canton to wrap of their day. 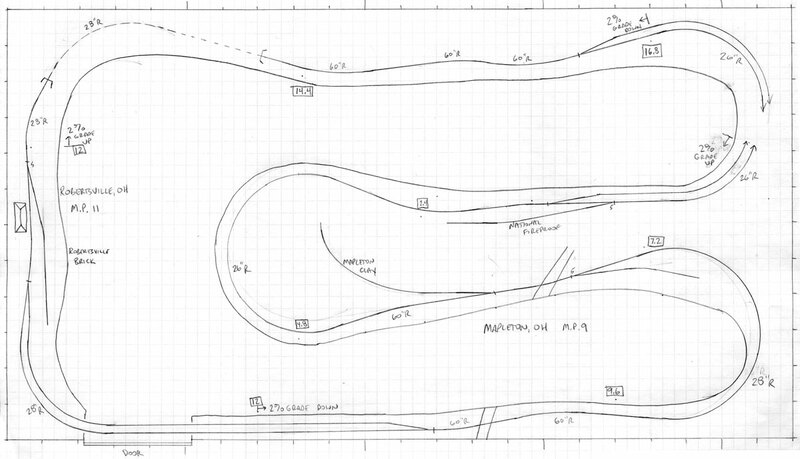 The Carrollton track arrangement again follows the prototype. The room parameters enable generous curves for this plan. The prototype line was originally built as a narrow gauge and twists through the rolling Ohio hills. Using broad curves to snake the tracks along the route conveys the feel of a branch line. Tim, John and I travelled through the area a couple of years ago and I was struck with the remoteness of the region. We weren’t far from Canton, yet it seemed like a completely different place. John is not planning for this railroad to be a high speed freight line with bunches of trains whizzing by all day long. He wants this to reflect a quiet, yet still vital, branch line operation. He envisions three or four people operating during a session. I believe he wants a Canton yard operator, a Carrollton local turn and a Minerva turn for his basic sessions. I’ve added the Belden Switch and some East Canton industries to keep the yard guy busy, but overall the plan reflects the branch and should keep a crew busy for a four or five hour operating session. I haven’t done this kind of planning in a long time and forgot how much I enjoy this kind of exercise. It has spurred me to reconsider the space I have at hand. The available room isn’t much, but I think I can do something. Here’s an outline of my space with some dimensions called out. The two long walls are candidates for layout placement. I need to keep the spaces open near the doors. I am also not fixed to a specific Wheeling & Lake Erie location, but would like this to be grounded in a prototype location. I’ve got some ideas already, but we shall see what evolves. I’m sure Tim may send along a few of his ideas very soon! Click on this thumbnail for a larger image. Interaction with friends and helping them understand the potential of their space is one of the elements I enjoy most in this hobby. It isn’t necessarily where you are and what you are doing now that is as important as where you may be headed. Please feel free to leave your comments below. All comments are reviewed and approved before they appear. Good work John! I’ll give you an A for this reporting term. Your description of the railroad is clear and accurate. Your design is thought provoking. I’d consider replacing the East Canton trackage with the PRR interchange at East End Yard. That would give John some place to “bang gondolas around”. Scrap metal going up to East End Yard & Republic Steel was commonplace. Another thought would be the team track at Stemples. You would almost be “in” Stemples while trying to have room to switch in Carrollton. Your design is inspirational and ambitious. Thanks for sharing it with us all! Thanks for your comments, Tim. I’d like to reiterate that the multi-level plan I drew was a very quick, one-pass kind of exercise. I knew the physical locations where I wanted to plot Canton Yard, Carrollton, Minerva, Minerva Junction and Oneida. Much of this was based upon your first plan. After I did the first quick sketch and measured the track distance around the room from the door, I realized there were possibilities with a multi-level plan and a main line grade that would not be difficult. Stemples and Mapleton were added because the distance between other points was stretched out. You and John know this branch and have taught me a good deal about topography, industries and operations along it. You mention Stemples is a bit close to Carrollton and I would agree. In creating another version, I would move Stemple more towards the door and try to keep that shelf level 12 inches wide, or less. I’d also curl the two interchange tracks into the corner of Canton Yard; not concentric with the yard tracks but slightly spiralling away from them. This would give just a little more room for freight interchange. I’ll have to consult the track diagrams for Canton Yard and East Canton again. I must have missed the PRR interchange there. Or was this interchange on the Belt Line to the Ford plant? I also recall John’s desire for junkyard and gondola switching and that’s why the Belden Switch was included along the long wall to the right of the door on the lower level. The added bonus is a brick plant at the far end. I’m certain there are several tweaks to make this plan more desirable and buildable. I would probably aim the end of track at Carrollton into the corner and keep the team tracks parallel to the main there. This means the benchwork can be cut back in this area and gives the Minerva Junction scene a little more breathing room. Anywhere the track is on a narrow benchwork segment can be built more as a thin shelf with just a 3/4-inch plywood plank. This eliminates depth problems where the railhead height is less than ten inches. Keeping the scene profile narrow and thin enables the grades to work. If you treat these stretches of main line as scene connectors then deep, detailed scenes are not necessary. I’m very happy that the multi-level plan is being considered for John’s new layout space. He’s got a real jem of a room that few people have. Combined with a feasible prototype and operations scheme, he’ll have a nice sized railroad to keep him and a few friends busy. He may even squeeze in workbench space under Mapleton. After noodling and fiddling with this thing, I have to say…. I’m too short and don’t wanna stand on a box to operate. What can you do to keep the upper level at our (we’re close to the same height) shoulder level and maintain a 12″ space from the rail head of the lover level to the bottom of 4″ minimum fascia on the level above it? Talk about a run on sentence – my Mom would be after me in the old days! So I’m guessing the upper level to be at 60″ – tops. Subtract 4 for the fascia and subtract 12″ for the operators gap (16″ so far), we come down to 44″ for the second level. Do it one more time to get to Canton and the Belden Switch and we are at 28″ off the floor. Kinda low, ya know a desk is at 30 to the writing surface. So if we’re seated in a rolling chair at Canton and at 30″, we climb to 46″ at the second level and add 16 more (62″) for the stop at Carrollton. I do not think my Alco S-4 can negotiate that tough a grade and pull a 5 to 8 cars (Crummy included) to Minerva Jct. or direct to Carrollton. I would love to see or discuss any proposals. I absolutely am infatuated with this concept. No need to get in a hurry here.. I am hoping FreeMo and Jerry will fill my needs for the time being. Any plans to return to Ohio for FreeMo or RPM? We’ve got Lodi coming up and Williard in October. Gotta pass thru Cleveland to get to NTS in Michigan. Would love to spend some time……. And thanks for the passing grade on the “test”. John, remove the fascia thought and dimensions and this works better. The subroadbed thickness at the far end of Carrollton needs to be as thin as possible, possibly just a 3/4 inch plywood subroadbed shelf. The fascia there can be a strip a little wider, possibly an inch and a half tall to offer consistent presentation. Maybe include a small shelf at the base of the fascia to prop up the car cards when working there. When not working Carrollton, I recommend all car cards go in a bill box that fits in a hole on the left end of town where the fascia may extend down to hide the Robertsville tunnel. As for rail height, hold an arm out and measure to the bottom of your arm close to your arm pit. You and I are about the same height and my dimension is 56 inches. Start with that as your top rail elevation then subtract the plan elevations from the top. If Carrollton sits at 22 inches, then Canton should sit at 34 inches. The grade is slightly adjustable between Robertsville and East Canton and can be a little less than 2%. Also, if you add an inch to Carrollton and subtract an inch in the grade between Robertsville and East Canton, then you have gained two inches in height for Canton; 36 inches. As with any multi-level design, there are compromises to make in order to fit the needs. Note the aisle at Canton Yard is spacious enough for the yardmaster to be seated on an office chair. But would this really be used in an op session? I see a crew headed to Carrollton, maybe another to Minerva and another that handles Belden and East Canton. That is a full room of people. Why not create some mock up levels from plywood to understand the height relationships? That would be the best way to see how this can work. John, I forgot to answer the last part of your post! I currently have no plans to return to Ohio this year and attending the NMRA National or NTS show is beyond my budget. I’m hoping to attend the Syracuse train show with some Free-mo modules, but that is tentative.